Sunday, October 28, 2018 at 5 pm. 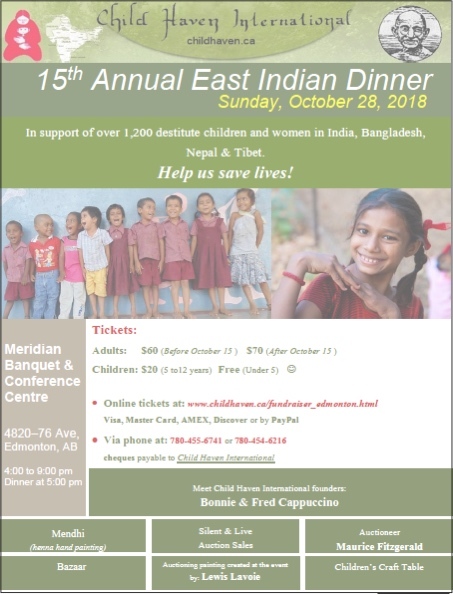 The Annual Edmonton Child Haven dinner will be held on Sunday, October 28, 2018 at the Meridian Banquet Centre, 4820 – 76 Avenue NW, Edmonton at 5 pm. Adult tickets are $60, Children 5-12 years are $20 and children under 5 years are free. Bonnie and Fred Cappuccino will be in attendance and show slides of some of the children. There will be a bazaar, silent and live auction, children’s craft table and auctioning a painting created during the event by artist Lewis Lavoie. We hope you will join us. Tickets are available from Sylvia Krogh at skrogh@shaw.ca, phone 780-454-6216. Sylvia Galbraith is having a garage sale in July and all proceeds will be donated to Child Haven. Sylvia Galbraith lives at 10728-125 Street NW, Edmonton. If you have any contributions – they would be appreciated. If you are not able to deliver the donations she will pick them up if you contact her at 780-455-6741.